← Bonaire daily life, part three. I admit, I love my job as a dive master. 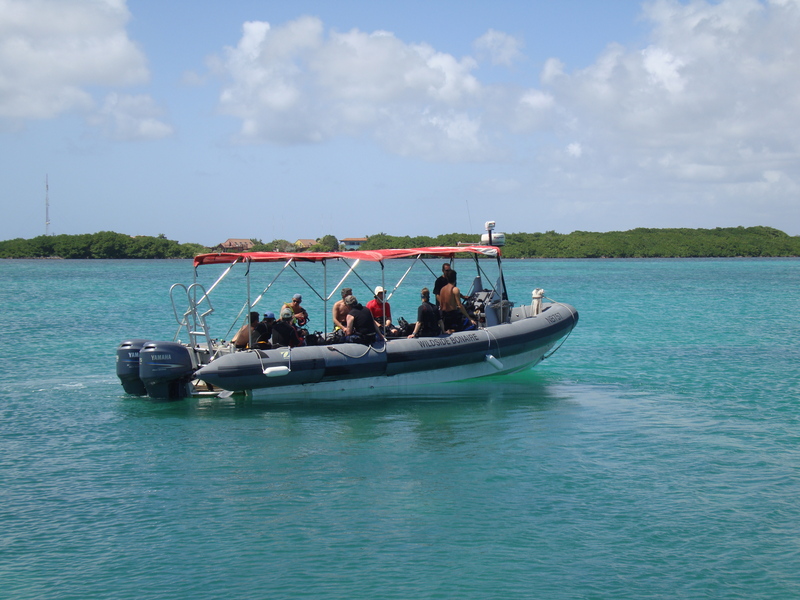 Especially at the East Coast of Bonaire, where few divers dare… Why that is, I don’t know. Maybe it is because shore diving is so much easier on the leeward side. But we go by boat. The boat drops us at the edge of the shallow terrace where we see huge fields of Sea Fans waving in the surge. We go down the slope. I have my marker buoy on a line to let the captain know where we are. No need to swim against the current, the boat will pick us up wherever we surface. Just drift with the current, that’s the way I like it! 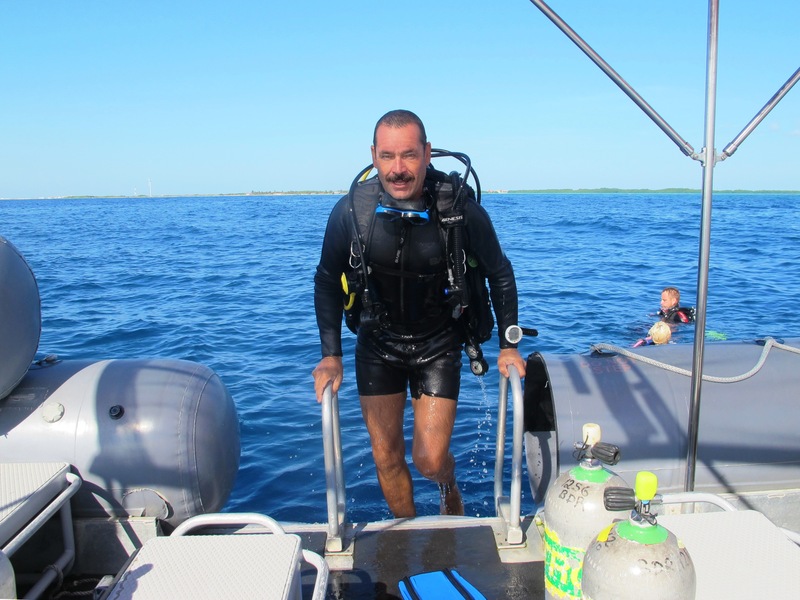 With experienced divers, guiding dives is about pointing out worthwhile critters. On the East Coast that is not an easy job. Green Turtles, Hawskbills, Eagle Rays, Stingrays, Green Morays, all kinds of Groupers, Triggerfish, Barracudas, Tarpons and more. It`s all there, in a scenery of healthy Gorgonians, Sponges and Stony Corals. But sometimes they all come at the same time and you need to be an octopus to point them all out. I already told you, being a dive master is not easy. But somebody’s got to do it. Divers love to see Sharks. Unlike the rest of the world, who get their knowledge from movies like Spielberg’s Jaws, divers know that in general sharks are not man-eating monsters. Out of the 440 shark species, only 4 have been involved in a significant number of unprovoked fatal attacks on humans. Most sharks don’t bother us if we don’t bother them. Sharks are beautiful fish to look at. Unfortunately they are rare on Bonaire. Still every once in a while, I am lucky enough to see a Nurse Shark sleeping under an overhang or a Reef Shark graciously passing by. Even a small chance to see one makes our diving more exciting. It usually is a bit choppy on the windward side of the island, but boarding our dinghy is easy with part of the collar deflated and removed to put a ladder in. We go back to the quiet water of the bay for the surface interval. The different shades of blue of the bay always amaze me. Every once in a while a turtle comes up to breathe. First we see the head, and when they are close enough we see the carapace. After a while the Turtle swims down again. And then it is my turn to play with the boat and my colleague’s turn to guide the dive. Once I got everybody in the water I just sit and look out over the endless ocean. The sunlight playing with the everlasting motion of the waves never bores me. It’s meditative, it makes me go to my nothing box. Maryam, a very good friend of mine once joked at me: “The only thing you men are really good at, is just sitting and staring at the sea.” Waiting on the boat for the divers to come up, I realize she was so right. A man has to use his talents! 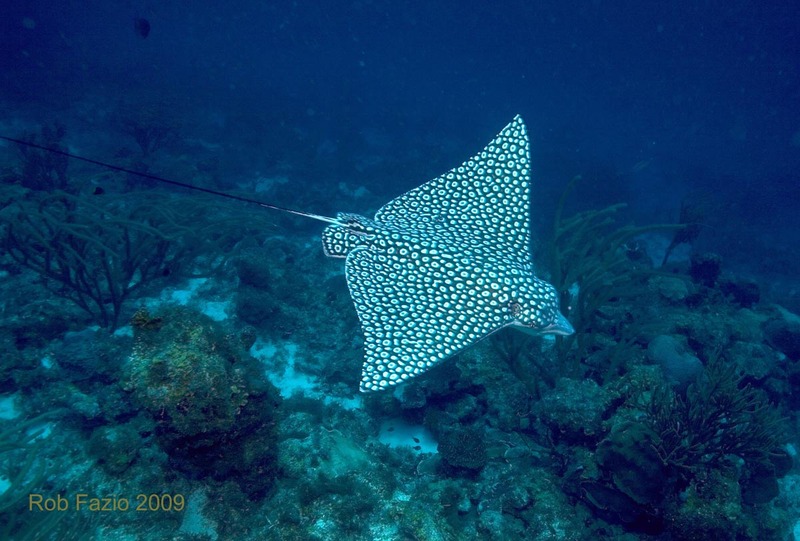 This entry was posted in Bonaire, boys toys, Eagle rays, favorite reef, Green Moray, nature, Sharks, travel. Bookmark the permalink.